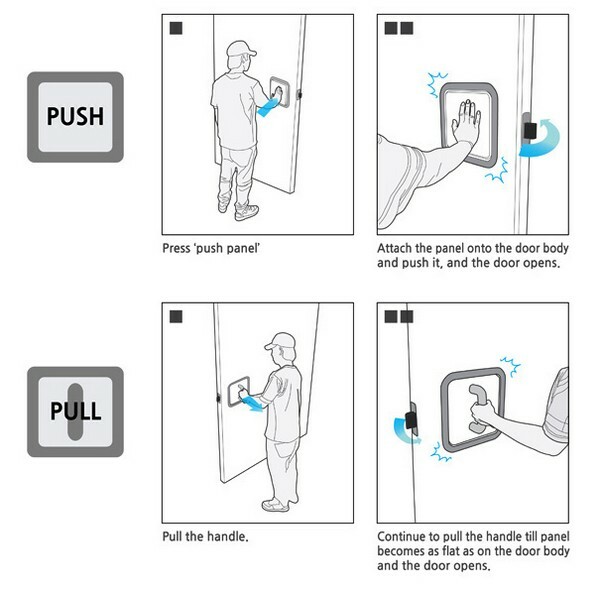 Door handles are a simple concept, but not so simple that they don't require instructions. Lovely, minimalist doors worldwide are made less strikingly beautiful by the application of crude "PUSH" and "PULL" stickers, distractions that could be done away with if we all used the In & Out Door, a concept by Korean student Jeon Hwan Soo. On one side it has a handle for pulling. On the other? A pad for pushing. Either activates the latch as shown below, making it reasonably simple to figure out what you're supposed to do. It's just a concept now so it's only capable of opening up theoretical portals, but we expect to see these showing up at the Midvale School for the Gifted very soon.